The carrots are past their best. No longer firm and snappable, they bend like a theatrical prop. No wonder really, they have been sat outside in the sun on the table for a day and a half. I’d forgotten about them among the tumbling bags of vegetables I’d brought back. Still, that doesn’t mean there isn’t a use for them. A few made it into my morning smoothie and the rest, determined to make something with them, I turned into cake. Surely bendy and tired fruit becoming cake is like turning base metal into gold. And not only that, I used coconut sugar in the mix rather than cane. So it’s almost doubly less healthy. If you don’t count the icing sugar mountain that went into the cream cheese icing. As a cake is a treat, let’s not beet (sugar) ourselves up about things being unhealthy. 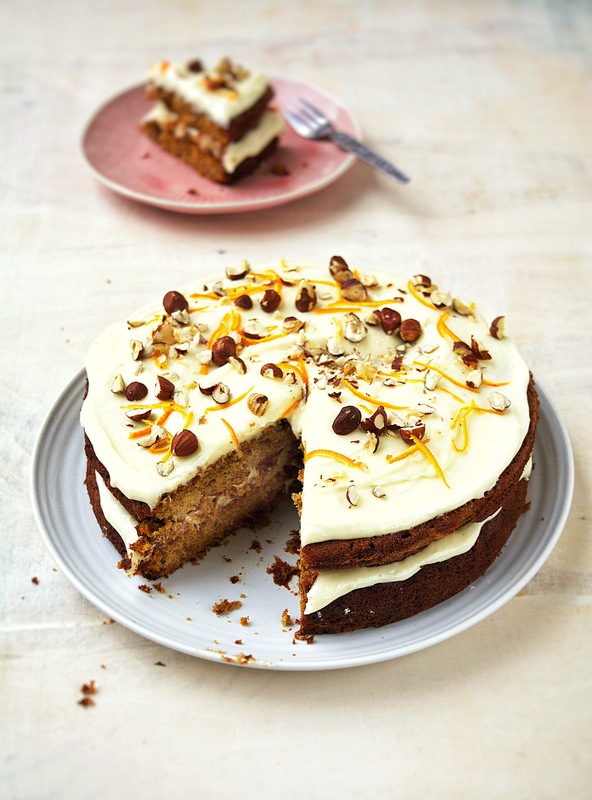 It’s not as if I had a slice of it for breakfast the other day… But this cake is delicious, moist and with the fragrant scent of orange blossom and clementine zest, is a wonderful moment of calm with a coffee or tea mid-afternoon when spirits are flagging. If you don’t hoover the lot up in one sitting (assuming you’re sharing) it keeps soft and moist for what seems an eternity as long as you keep it covered. I can’t see that happening though. Cream together the butter and sugar. Beat in one egg at a time until well mixed then stir in the flour and baking powder little by little until you’ve used it all. Try not to over mix it. Leave the cake to cool completely or it’ll be sliding all over the place like a plastic fire guard. Beat together the butter, cheese, icing sugar and vanilla until soft and smooth. sandwich the cakes together with a good load of the icing then coat the top and sprinkle over the zest and nuts. Chill for about half an hour if it’s a hot day to give the icing a fighting chance then serve.